Dr. Patricia E. Ortman, founding member of the Girls Gotta Run Foundation. (Photo by Michelle Mikki Parrish). Washington, D.C. (TADIAS) – “Why shouldn’t a girl have a pair of sneakers?” That’s the question that Dr. Patricia E. Ortman, a Washington, D.C.-based retired Women’s Studies Professor and artist, posed to herself as she embarked upon the task of raising money for Girls Gotta Run Foundation (GGRF), a volunteer organization she helped establish three years ago to provide new shoes for girls in Ethiopia who are training to be runners. Getting involved she did; she called a couple of friends and expressed her interest in starting a program to help Ethiopian girls stay in school. “Originally” Ortman says, “I wanted to do this as a project, and as people were coming [up to me] and saying they wanted to help, I started calling a lot of international woman organizations.” But the overall lack of interest by these organizations, whose names she would not mention, left Ortman and her friends with little choice but to start Girls Gotta Run Foundation (GGRF). Despite the obstacles, there was a light at the end of the tunnel for Ortman. 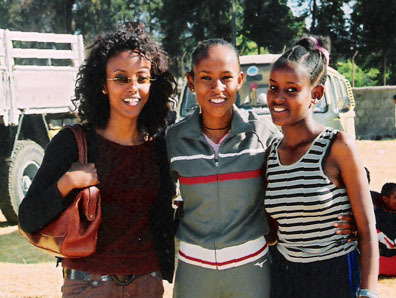 In recent years, running has emerged as a path to success for many girls in Ethiopia. Female athletes, such as double Olympic champion Tirunesh Dibaba and her colleague Meseret Defar, are blazing a trail for a new generation of aspiring female runners. Today, some of the highest paid athletes in Ethiopia are women. Today, GGRF sponsors forty girls participating in three teams: Team Tesfa, The Semien Girl Runners, and Team Naftech. Members of Team Tesfa (Photo by Sarah Murray). The Simien Girl Runners training in July 2008. (Photo: GGRF). Defar, and Meseret Birhanu, member of Team Tesfa. (GGRF). And what is his organization’s relationship with GGRF? If you would like to help or join GGRF, you may reach Dr. Patricia Ortman at pat@girlsgottarun.org. Click here for the Foundation’s calendar of events. Check out GGRF’s current art exhibition at Friendship Heights Village Center (4433 South Park Avenue Chevy Chase, Md 20815). Thank You, Martha and Tadias! Fabilous! Patricia, you are an amazing and incredible person. What an inspiring and touching story. Only if the world had more people like you who embrace the world with open arms and give with open hearts. I will certainly support GGRF. You will hear from me soon! Thank you Tadias and Matha. Great job I enjoyed the article and I learned something. Keep up the good work. It’s an excellent article and real informative. Thank you Martha and Tadias for educating us on this important issue that we all should be concerned about and help in any way we can. Dr. Ortman – I really appreciate what you are doing to help out these girls. Martha, this is great article and great program. …, empowering young athletics to succeed in life and in return to help back the communities and follow the footsteps to empower the future children is wonderful thing to do. The girls will be happy and encouraged to aspire high and become fruitful citizen of tomorrow. I will be in touch to help. Thanks to everyone who replied! We look forward to hearing from and working with those who are interested. I absolutely loved this story. 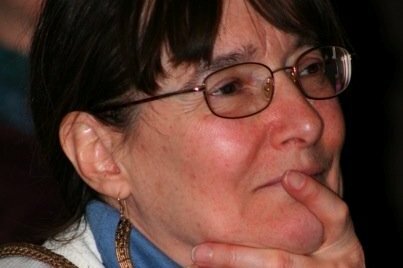 Dr. Patricia Ortman, what you are doing is highly needed and of course rewarding! We Ethiopians should be doing more of this, instead of bickering amongst each other. That’s why I love Tadias Magazine for bringing us so many interesting, very well written, informative, inspiring and entertaining stories. I love you guys and please keep it up! And thanks Martha. Thank you Martha for telling this story. Girls Gotta Run, you guys are true human beings. I myself was a track and field reporter in Ethiopia. I have traveled to Asela, Bekoji, Asasa, and parts of Bale, where Ethiopia’s long distance running sensations hail from. All the young runners ask for is SHOES. Too expensive for them, cost about the price of a cow to buy proper running shoes. GGRF, check out what A Running Start is doing in East Africa. There is a possibility of working together. HI Marti, i read the article. Thank you for giving us this useful information. I love your articles. keep it up. I appreciate Dr. Patricia for what she is doing. Thank you for airing this news, I know Dr. Patricia in person & and I have been in some of her art exhibition, she is an extraordinary person, her commitment for the cause is beyond one can imagine. She is a tireless and never says quit kind of person, I would say to each and every one of us we can play an important role if we step up on her plate to help those children who are unable to help themselves. and would love to send some money for some shoes.